Police fired volleys of tear gas and water cannon to disperse hundreds of protesters who gathered in Istanbul's landmark Taksim Square to enter Gezi Park which has been at the heart of protests since late May. The Taksim Solidarity Platform, which encompasses a vast collective of political groups, organized the march, calling for protesters to try and gain access, according to Reuters' witness reports. "We are going to our park to open the doors to its real owners ... We are here and we will stay here ... We have not giving up our demands," the umbrella group said in a statement. The organizers of the demonstration said it was to draw attention to a court ruling against Prime Minister Erdogan’s plans to redevelop Gezi Park. Responding to the move, Istanbul’s governor warned that any attempt to do so would be met with a police response. "I can't allow a demonstration that I haven't permitted in advance," he said. Since May 31, Istanbul has turned into the epicenter of anti-government demonstrations, when the police broke up a sit-in staged in the capital’s landmark Taksim Square to protest against the government’s redevelopment plan involving building on a nearby park. In June an Istanbul court ruled against the development plans that included building a replica Ottoman-era barracks at Gezi, which has been a traditional gathering point for rallies and demonstrations. The ruling was deemed a victory for protesters and a blow for the Prime Minister who stood vehemently against protests and riots, accusing their perpetrators of being terrorists. The court’s decision however, is not final and is expected to be appealed to a higher administrative court. On Saturday the protesters' way was cut off by police who fired tear gas and water cannon in an effort to disperse the protesters and stop them from entering the square. Despite the warning, some 3,000 demonstrators, chanted "Together against fascism" and "Everywhere is resistance", gathered in the Istiklal Avenue to march to the cordoned-off park near Taksim Square. 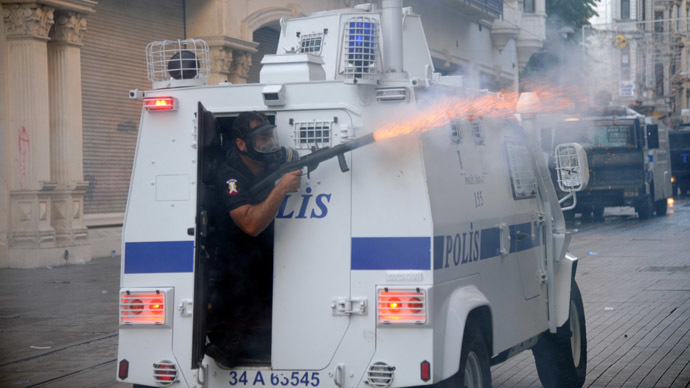 According to reports, fighting between the security forces and protesters started after some of the demonstrators argued with police over their right to enter Gezi park. "Hurriyet TV shows images of one child affected by tear gas. Repressors against all," reads the tweet. The demonstration had been scheduled for 7 pm local time. The water cannon was reportededly deployed down side-streets close to the square. One side street, Istiklal, was the scene of tear gas deployment on June 22, when clouds were unleashed on crowds ushered away from the square. Troops hounded the protesters back into the side streets in what bystanders labeled the biggest police intervention since mid-June. Several people were detained by police, according to Reuters. "The Constitution says that anyone can stage a demonstration without giving notification, but the legislation says that applying to the authorities for permission is mandatory. So nobody can say they exercise their constitutional rights. This is unlawful," Gov. Hüseyin Avni Mutlu had told reporters in response to news of the protest. Approximately 2.5 million people have taken to the streets across Turkey since May 31, when a harsh police crackdown against activists in Istanbul’s Gezi Park prompted mass nationwide anti-government protests, according to a report published by Turkish Hurriyet Daily News at the end of June. Major protests have been witnessed in 79 cities nationwide, with a majority of the demonstrations taking place in Ankara and Istanbul. Five people have been killed and around 4,000 injured – including 600 police officers – over the course of the mass demonstrations, and around 4,900 protesters have been detained. The report further stated that some 58 public buildings and 337 private businesses were damaged, while 240 police vehicles, 214 private cars, 90 municipal buses and 45 ambulances were left unusable. Total damages are estimated to have cost over $72 million.